The Nyaka AIDS Orphans Project: Maritina and Shallon are Going to Malawi! Maritina and Shallon are Going to Malawi! Two Nyaka students are among the 100 girls selected to participate in the Girls’ STEAM Camp in Malawi this summer! 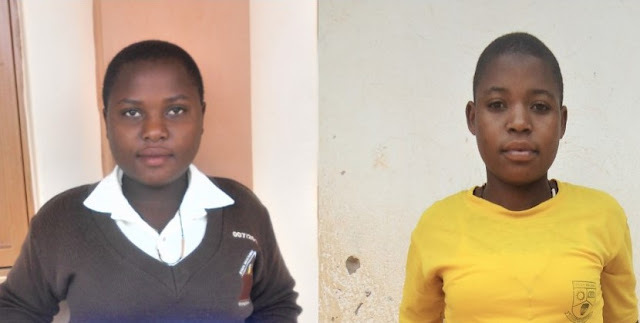 Maritina is from Nyaka Vocational Secondary School and Shallon is from Grace High School. They were selected from a highly competitive application process. This is the third annual Women in Science (WiSci) Girls STEAM Camp (STEAM= Science, Technology, Engineering, Art & Design, and Mathematics). WiSci Malawi will bring together 100 high school girls from Liberia, Malawi, Rwanda, Tanzania, Uganda, Zambia, and the United States, to work together to enhance their STEAM skills, empower them to develop their leadership potential, and build camaraderie and networks that will propel them to new opportunities in STEAM fields. The theme of WiSci 2017 is using technology to create a safer, more secure world, with a focus on preventing gender-based violence. Maritina and Shallon are among the six students from Uganda who will represent Nyaka, and the nation at large, on this platform scheduled to take place on July 29th - August 15th in Malawi at The Malawi University of Science and Technology (MUST). Instructors and trainers from private sector partners including Google, Intel, NASA, and ASM will lead classes introducing students to topics in science, technology, engineering, arts, and math (STEAM). Thank YOU for supporting Maritina, Shallon, and all of the girls at Nyaka. YOU provide them with opportunities that they never dreamed possible!